The clash between the Spanish giants ended in an intense 1-1 draw the Camp Nou. La Liga's top teams Atletico Madrid and Barcelona, on Tuesday, were involved in an intensive battle at the Camp Nou in search of three points after Real Madrid drew Villareal. Though the match was a 1-1 draw, the changes made by both the managers, either forced or tactical, had impacted the outcome. While Luiz Enrique will be sweating over the fitness of Leo Messi and Sergio Busquets, Diego Simeone will be happy that his side was able to go home with a point. Barcelona (4-3-3): Marc-Andre Ter Stegen; Sergi Roberto, Gerard Pique, Javier Mascherano, Jordi Alba; Ivan Rakitic, Sergio Busquets, Andres Iniesta ; Luis Suarez, Lionel Messi, Neymar. Luis Enrique's rotation of his men looks like a long-term plan to win the league just like he did it during his first season with Barcelona. The ex-Celta Vigo boss made two changes from their victory over Leganes as Sergi Roberto and Sergio Busquets replaced Samuel Umtiti and Rafinha in the starting XI which worked perfectly well for the hosts during a fruitful first half. Atletico Madrid (4-3-3): Jan Oblak; Juanfran, Diego Godin, Stefan Savic, Filipe Luis; Koke, Gabi, Saul Niguez; Antoine Griezmann, Kevin Gameiro, Yannick Carrasco. Diego Simeone picked his strongest XI going into the match by making two changes to his side following the 5-0 triumph over Sporting Gijon. Juanfran and Gabi returned to the line-up replacing Sime Vrsaljko and Nicolas Gaitan, and they put in a solid shift while defending the goal from Barca's relentless attacks. El Cholo also matched his opponents' formation by employing a three-man attack of Carrasco, Gameiro, and Antoine Griezmann. 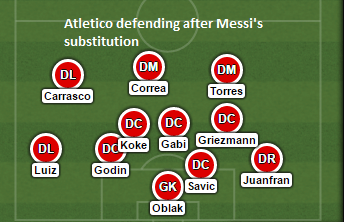 In recent times, Atletico have always followed a pattern whenever they have beaten Barcelona. Apply pressure in the opening minutes, make the Barca defenders fluff their lines, score an early goal, and shut down the shop. But Barca were not to be fooled this time around as they maintained their shape whenever Atletico moved up the field in numbers. Athletico, who are usually crisp with their passing at the centre of the pitch, were unable to do so, as the press applied by the midfield trio of Andres Iniesta, Sergio Busquets, and Ivan Rakitic nipped their attacks in the bud. While Barca's attacking trident of Messi, Suarez, and Neymar are usually are in the headlines for their goal-scoring exploits, it should not be forgotten that the Spanish Champions have another weapon in the form of set-pieces which have resulted in yielding 24% of their last season's goals. Even in this season, 4 of their 14 goals so far have come from dead-ball situations. 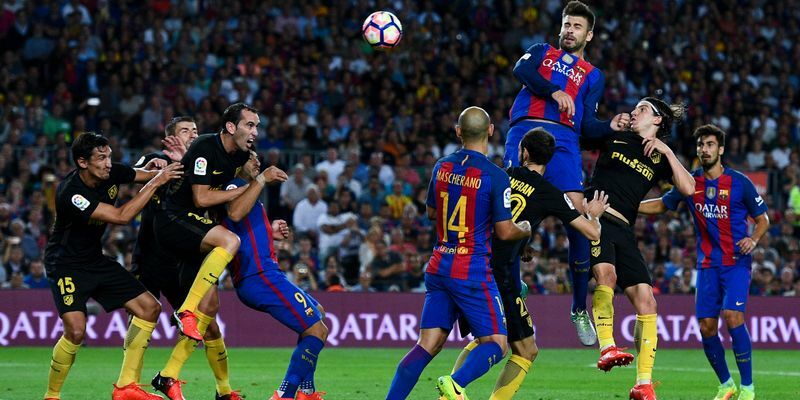 Besides having multiple free-kick takers in their ranks, the Catalans' innovation in taking the set-pieces make it difficult for the defenders to mark a particular zone. Atleti repelled several waves of attacks from the hosts, but a momentary lapse of concentration from Gabi and Savic allowed Rakitic to run free of his marker and head home from an Iniesta cross off a well-worked corner. Both the managers have been rotating their starting lineups frequently this season in order to keep their squads fresh for the long season, but Simeone's changes has not worked too well for him so far. His changes have resulted in two draws this season as the former Champions remain sixth in the table. But on Tuesday, lady luck favoured the Argentine coach, as Lionel Messi, who looked sharp after the first half, seemed to struggle due to his niggling groin pain and had to be subbed off in the 60th min. Simeone seized this opportunity and sent in Angel Correa to replace Saul Niguez. Barca's concentration seemed to have drifted a bit after the injury to their talisman, and Correa capitalized on a failed clearance from Gerard Pique and sent a cracking shot into the Barca net with his second touch of the match. Atletico pushed for the winner as Sergio Busquets' replacement Andre Gomes looked below par on the night. 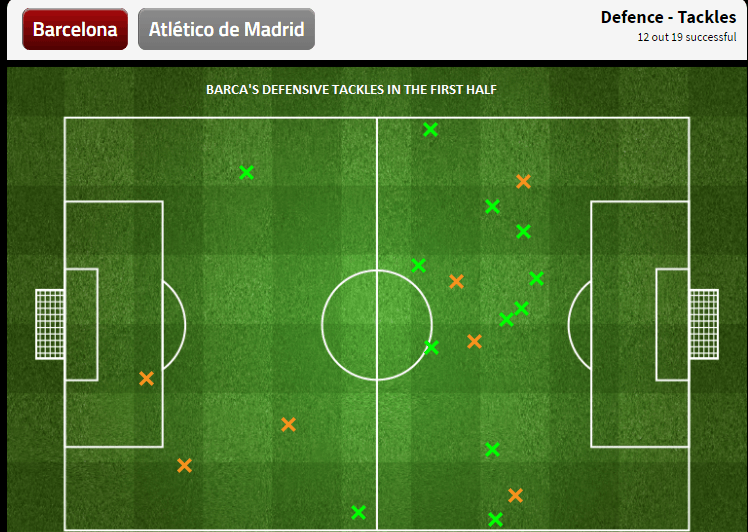 He was unable to exert the pressure that Barca did with Busquets, as a result, conceded possession to the visitors. Simeone was quick to notice this and sent in Fernando Torres for Kevin Gameiro as Atleti retained a perfect 4-3-3 formation after the hour mark after defending with their usual 4-4-2 for most parts of the match. Chances for a winner looked bleak for Atleti, as Barca tightened the screws in the final quarter of the match. Simeone had no other option but to send Ghanian midfielder Tomas to revert back to a 4-4-2. 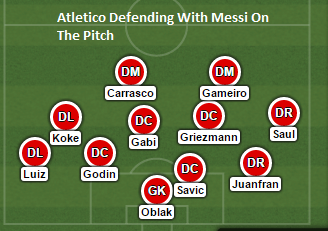 While Barcelona's main strength has been their star-studded attack, Atletico have their resolute defending to bank on. But the midfielders, who do not get enough credit whenever these two sides clash, had taken the centre stage in Tuesday's match after the forward line were unable to function at their usual high standards. Barcelona's midfield trio of Andres Iniesta, Sergio Busquets, and Ivan Rakitic have been solely responsible for keeping their team from harm's way. For the first half hour of the game, the trio made sure Atletico do not get hold of the ball by recycling possession in triangles and if the forwards lost the ball, Busquets and Iniesta quickly closed down Antoine Greizmann. As a result, Atleti wingers, Yannick Carrasco in particular, was unable to pick out the dangerous runs made by the French forward. It was only after Busquets' withdrawal due to a muscle strain did Greizmann grow into the game. Also, once Barcelona set up their camp in the Atletico half in the first half, it was evident that Rojiblancos would put all their 11 players behind the ball. Neymar, who put on a brilliant shift down the left wing, drew many saves from Atleti keeper Jan Oblak owing much to the brilliance of his midfielders. Busquets and Iniesta repeatedly switched play in the first half allowing fullbacks Jordi Alba and Sergi Roberto to overlap thus stretching Atletico's back four. Though this tactic was unable to break the watertight defence of Atletico, it created multiple chances for Neymar and Messi in an eventful first half for Barcelona. 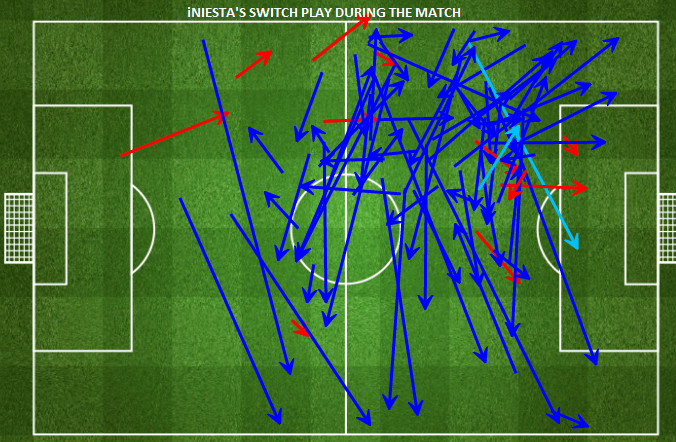 Their quality once again shone as Iniesta and Rakitic combined to give Barca the lead in the 41st minute. Rakitic was once again brilliant at the start of the second half as he supported Neymar's direct runs with some sumptuous cross-field passes.